When did you start working with Partners In Health? I started working with Partners In Health (PIH) in 2005. Before that, I was working as a math teacher in primary school. What exactly is your role as a CHW? Part of my role is to encourage women to be part of family planning, to go for prenatal care, to give birth in a health facility. I encourage community members to check their HIV statuses, people with severe coughs to check if they have tuberculosis, and people without health insurance to sign up for Rwanda’s “mutuelle” health insurance. I also emphasize sanitation, treat children under 5 who have malaria and diarrhea, and teach community members how to prevent malnutrition. I accompany weak patients through their treatments by following up with them and collecting medication for HIV patients. How many people do you visit? One community health worker follows up with about 50 families. The ones who have fewer homes still serve at least 30 families. They visit at least two families a day or 10 to 15 families a week. What is your role as a CHW supervisor? I visit families to see how they are doing and follow up on cases and see how we can help. I visit CHWs every month to see if they do the work they’re assigned. And we procure medication that the CHWs use to treat patients. What have you learned from working as a CHW? I have improved my leadership skills and learned a lot about health. I can even do this for my own family of three children. I have learned how to work well with people and have gained many friends. There are so many challenges, especially when urging people to go for family planning. Some think family planning causes cancer and other diseases. There is also so much work. For instance, there are times CHWs need to work in the field and then they get called to tend to patients. They have to ignore their farm. Being able to earn more would be helpful. 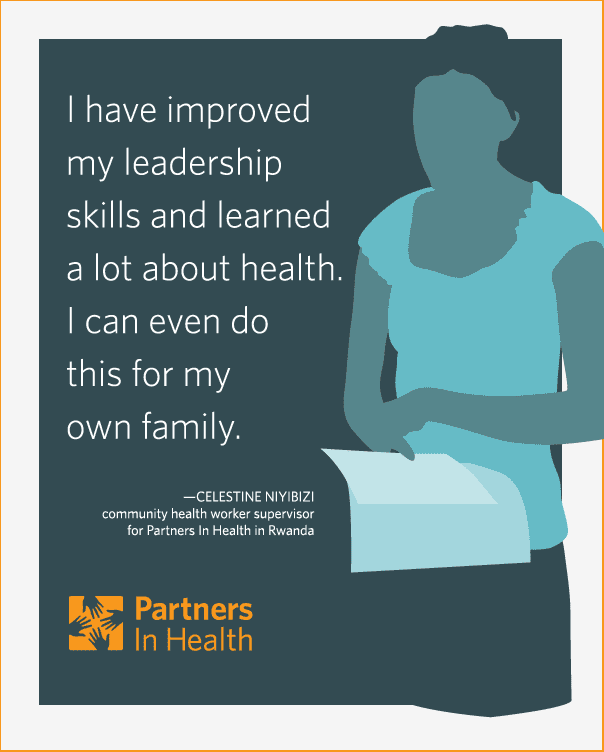 What has kept you with PIH for a decade? I’ve been offered so many jobs, but I am very passionate about my job. I like the people I work with at PIH. I have also gained so many skills at this job. I thank PIH—especially Didi Farmer and Nurse Peter—for it.